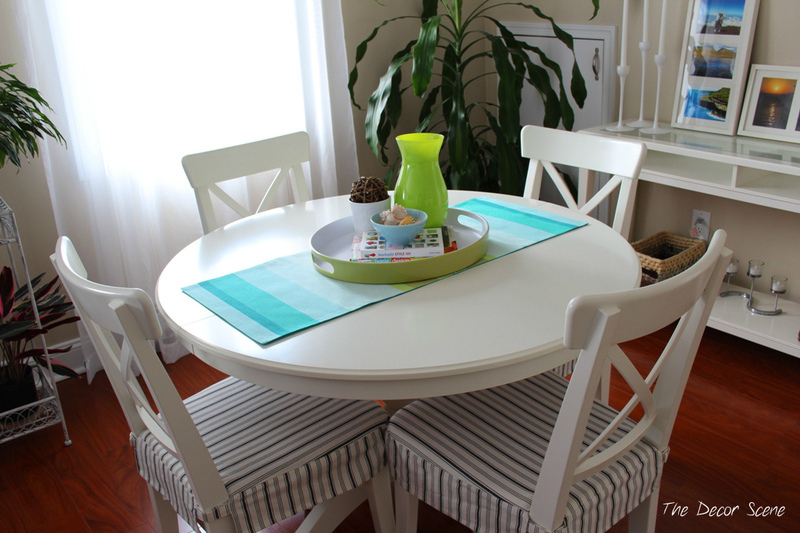 I have struggled with styling my round table, by Ikea, for awhile now. Rectangle and oblong are much easier for me to style, but I was determined to figure it out. I was going through my linen closet looking for something to use. I grabbed a couple of runners, which are usually too long for this size round table and they hang to long onto the chairs. 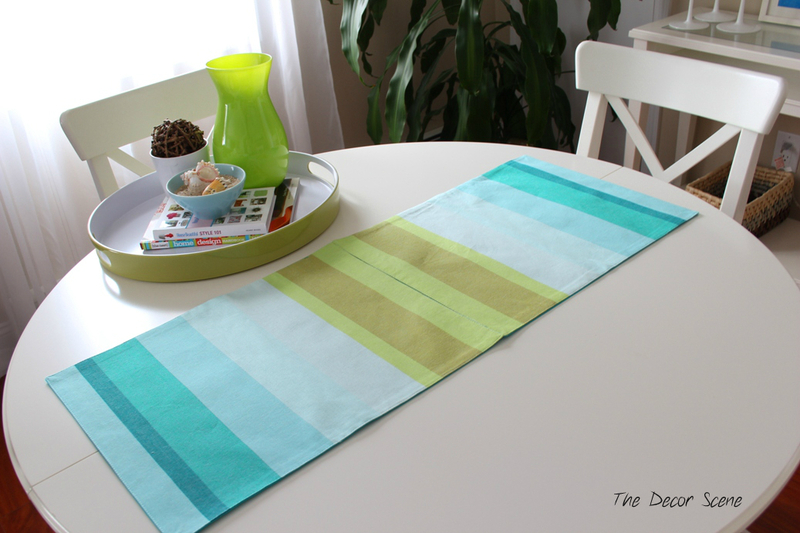 But this time I decided to grab two new place mats I bought recently. Well I actually bought 6 place mats, but I only needed two for this table. I put the two mats down in the center of the table and put the two green ends facing each other, so that when I put the tray on top the blue sections would be hanging out on each end and it looks like a short runner for a round table. See it looks like one runner in the center of the table instead of two place mats. Can’t see the seam of the place mat anymore now. The tray was the perfect size to hide the seam. I just “shopped” my house for some decor that I really wasn’t using. 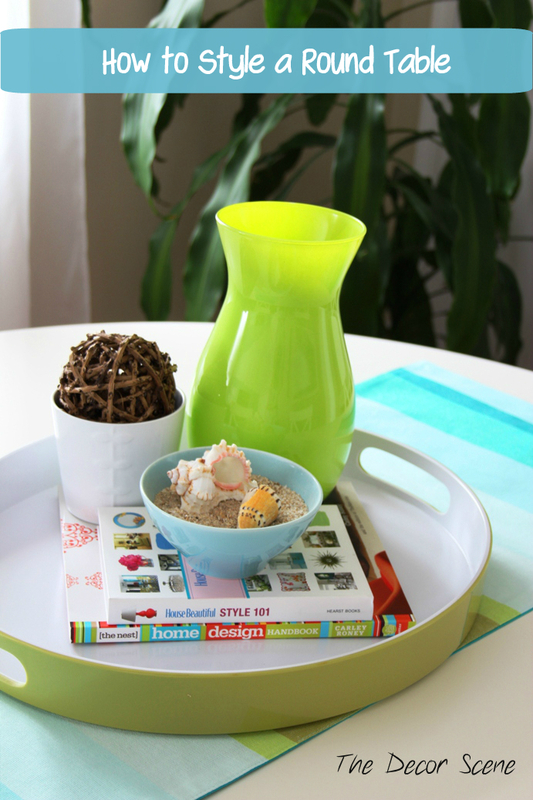 Two decorating books for some height so there was some dimension to it, taller green vase, short blue bowl with sand and seashells and a white planter with a decorative ball. 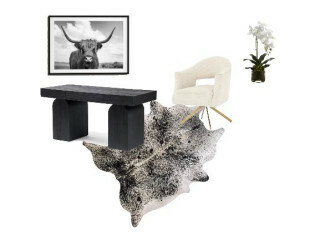 Some textures, some neutrals = easy styling for a centerpiece. I had fun putting this together and it only took me about 10 minutes to walk around the house shopping for some stuff and then 2 minutes to put it all together. I love how it turned out. 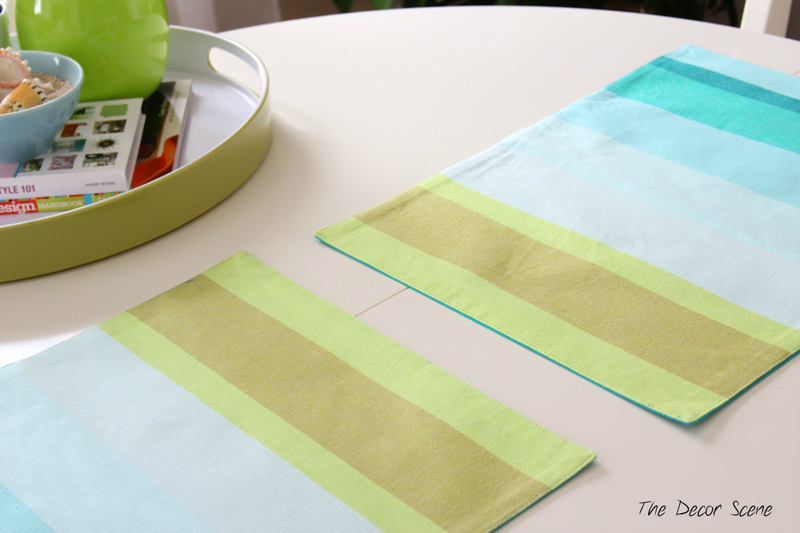 Why didn’t I think of the two place mats sooner then this? No idea, but I’m glad I thought of it now. 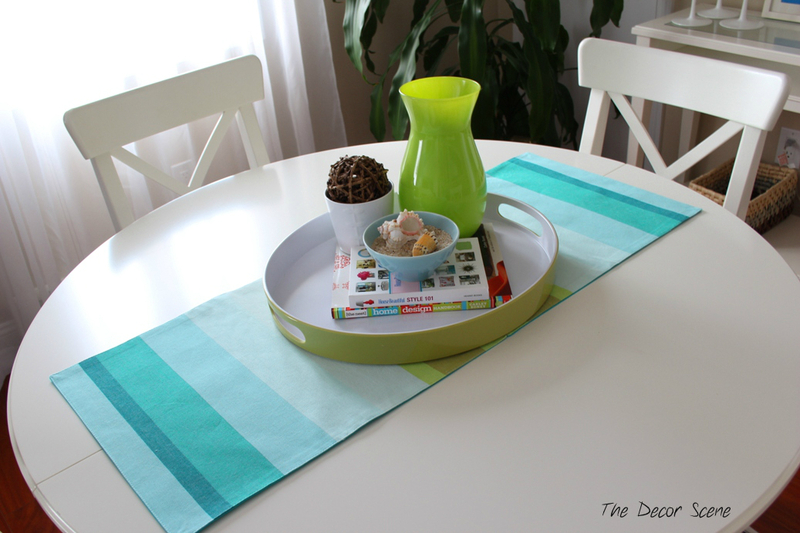 I love how it looks and I can do this with any two place mats now and change things up on the tray to have a new centerpiece. 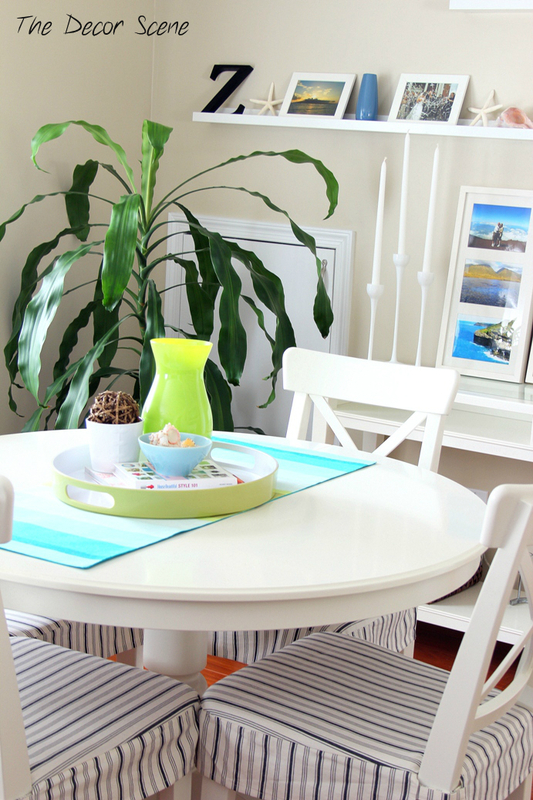 If you want to check out the rest of our Family Room click here. Some round table eye candy for you!!! 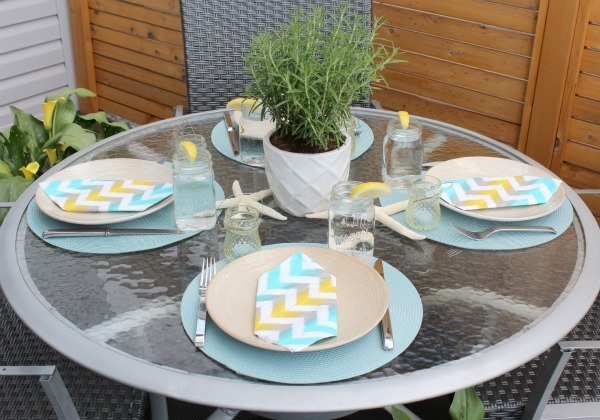 Let’s check out this cute outdoor table that Shauna @ Satori Design for living put together to dine al fresco style. Nice and simple but styled just right for my taste. Love the rosemary as a centerpiece for an outdoor table. Any herb would do, but I love the smell of rosemary and I hear it keeps the bugs away too. A nice floral arrangement is always a great way to go also. Great setting for a dinner party. Low enough to see everyone around the table, yet colorful and pretty to look at. Big clam shell with plants in it. Gorgeous!!! I love the colors of this centerpiece with the colors from the place settings. 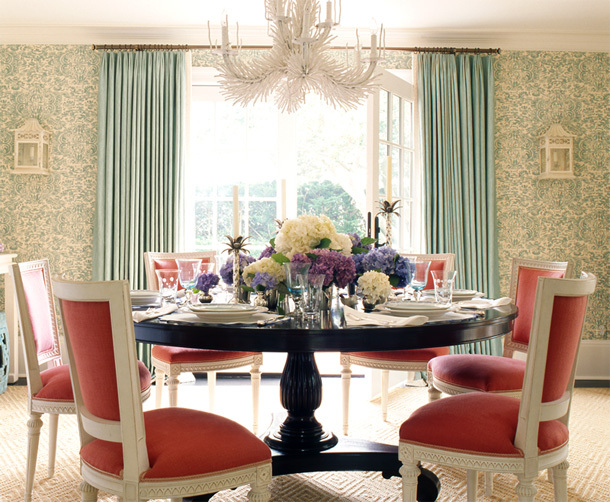 Traditional Dining Room design by Philadelphia Interior Designer Gacek Design Group, Inc. 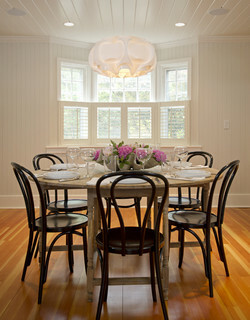 So how do you style your round table? How do you style any table you have? Indoors or outdoors. Leave a comment with a link to your blog or photo’s to share with the rest of us. 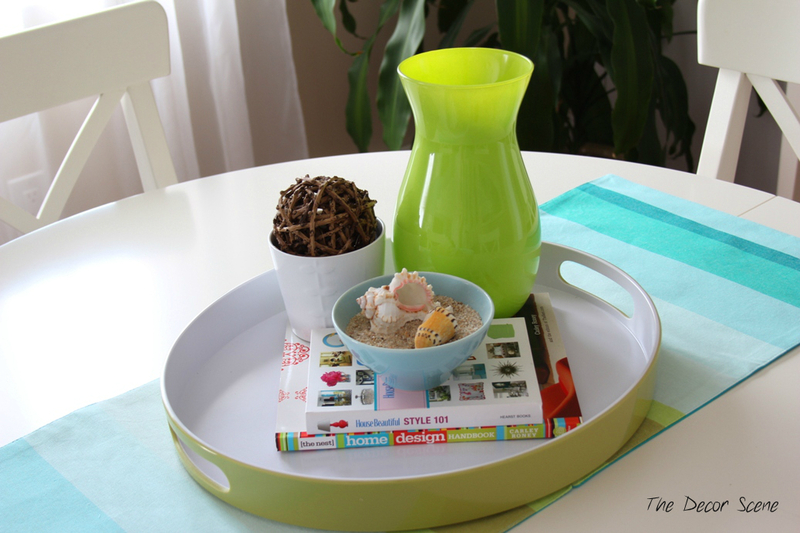 Happy table styling everyone. Thank you Vanessa! And thanks for stopping by.